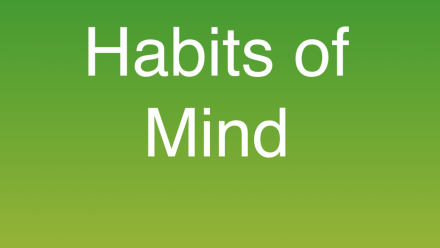 Habits of Mind – our focus this term! Developing the ability to think differently. To see an issue from more than one perspective. To remain open to new ideas that cause you to change your mind. Considering many options for solving a problem. A flexible mind will allow you to develop a more complete understanding of any topic. With a flexible mind you are able to explore multiple perspectives and options and in doing so evaluate which is the best. Flexible thinking allows you to develop a large tool kit of strategies to bring to problems. Flexible thinking is what makes the human brain more powerful than machines that are limited to one way of operating. Particularly when you are faced by a situation where your initial impression is stopping you from finding a solution or understanding a topic fully. When you use the same approach too often. When you are confronted by a different point of view and need to understand another persons perspective. Using what you know in new situations and to solve new problems. Making connections between new ideas and ones you learned in the past. Developing a deeper understanding by applying thinking from one situation to another. Coming to a conclusion to suit a new situation based on past knowledge, deductive reasoning. Using your Maths knowledge in a Science lesson, understanding a character in a novel by making connections to people you know. Building on and applying past knowledge allows you to learn in more productive ways. The more you learn the more past knowledge you have to apply and if you can do that well you can learn new ideas faster. Reflecting on prior learning and knowledge will also allow you to identify and correct misconceptions. Always. Whenever you are learning new material that has a connection with prior learning. When you reflect on new ideas and compare them to what you already know. When a new idea or point of view challenges what you already know. When what you thought was true, is causing you problems or seems to be wrong. Are the connections I am making correct and helpful in expanding my understanding? What parts of the new learning doesn’t fit with or challenges my old ideas? Which will I trust? Why? What strategy can I use to improve my recall or prior learning? Map your initial ideas on a topic and then ask, What is missing from this and where does the new learning fit? What do you think you know about this topic? What makes you say that? Connect, Extend, Challenge – How are the ideas presented Connected to what you already know? What new ideas are presented that Extend what you know? What is still Challenging for you about the new topic and/or its connection with prior learning? Use individually recording your responses on paper or in a group with each member responding to the three questions in turn. Think, Puzzle, Explore – Answer these three questions: What do you Think you know about this topic? What questions or Puzzles do you have? How can you Explore this topic? When exploring begin by looking for ways to expand on what you already know to maximise the benefits of your prior learning. Generate, Sort, Connect, Elaborate – Generate by brainstorming a list of at least of initial ideas based on what you already know about the topic. Sort these by relevance to the new topic, maybe colour code. Connect ideas with lines to show connections. Add new information to this and continue to build links as you Elaborate on your understanding and explore the new learning. I used to think . . ., Now I think . . . – When you are reviewing a topic take time to include this simple routine. Start with ‘I used to think . . . ‘ then move on to ‘Now I think . . .’. Add power by combining with ‘What connections are there between the two?’. This routine should help you identify connections with prior knowledge and allow you to identify which parts are entirely new. This term’s HABIT OF THE MIND FOCUS is METACOGNITION – or in other words ‘thinking about our thinking’ as we go about our learning. Occurring in the neocortex, metacognition is our ability to know what we know and what we don’t know. It is our ability to plan a strategy for producing what information is needed, to be conscious of our own steps and strategies during the act of problem solving, and to reflect on and evaluate the productiveness of our own thinking. While “inner language,” thought to be a prerequisite, begins in most children around age five, metacognition is a key attribute of formal thought flowering about age eleven. Probably the major components of metacognition are developing a plan of action, maintaining that plan in mind over a period of time, then reflecting back on and evaluating the plan upon its completion. Planning a strategy before embarking on a course of action assists us in keeping track of the steps in the sequence of planned behavior at the conscious awareness level for the duration of the activity. It facilitates making temporal and comparative judgments, assessing the readiness for more or different activities, and monitoring our interpretations, perceptions, decisions and behaviors. An example of this would be what superior teachers do daily: developing a teaching strategy for a lesson, keeping that strategy in mind throughout the instruction, then reflecting back upon the strategy to evaluate its effectiveness in producing the desired student outcomes. Intelligent people plan for, reflect on, and evaluate the quality of their own thinking skills and strategies. Metacognition means becoming increasingly aware of one’s actions and the effect of those actions on others and on the environment; forming internal questions as one searches for information and meaning, developing mental maps or plans of action, mentally rehearsing prior to performance, monitoring those plans as they are employed–being conscious of the need for midcourse correction if the plan is not meeting expectations, reflecting on the plan upon completion of the implementation for the purpose of self-evaluation, and editing mental pictures for improved performance. We want our students to perform well on complex cognitive tasks. A simple example of this might be drawn from a reading task. It is a common experience while reading a passage to have our minds “wander” from the pages. We “see” the words but no meaning is being produced. Suddenly we realize that we are not concentrating and that we’ve lost contact with the meaning of the text. We “recover” by returning to the passage to find our place, matching it with the last thought we can remember, and, once having found it, reading on with connectedness. This inner awareness and the strategy of recovery are components of metacognition.